Orange County Mayor Teresa Jacobs recently attended the graduation ceremony of the third class of the Orange County Experience at the Board of County Commissioners Chambers. The 12-week educational program kicked off last fall and provides citizens and community leaders the opportunity to learn more about Orange County Government and the vital services that the County provides to the region. The Orange County Experience offers an inside view of the internal operations of the County from technology and infrastructure to neighborhoods and health and family services. Orange County staff provided presentations and tours of the Convention Center, Fire Rescue, and Parks & Recreation. The group also met with Jan C. Garavaglia, PhD, known as “Dr. G,” who serves as Chief Medical Examiner for the District Nine Medical Examiner’s Office for Orange and Osceola counties. Orange County is home to more than 1.2 million residents, and welcomes more than 59 million visitors annually. Orange County is the number one, world-wide destination for tourism and travel, generating more than $187 million in tourist development taxes. Orange County Mayor Teresa Jacobs provides the overall strategic direction for Orange County’s future – including the development of a comprehensive and far-reaching Sustainability Plan – and serves as CEO for the organization, including administration of an annual budget of more than $3.4 billion, with 88 divisions and 7,658 employees. More than 30 people participated in this year’s Orange County Experience – the highest number of members since the series launched in 2012. Graduates of the program often go on to serve on County citizen advisory boards and continue their service to Orange County through other volunteer opportunities. 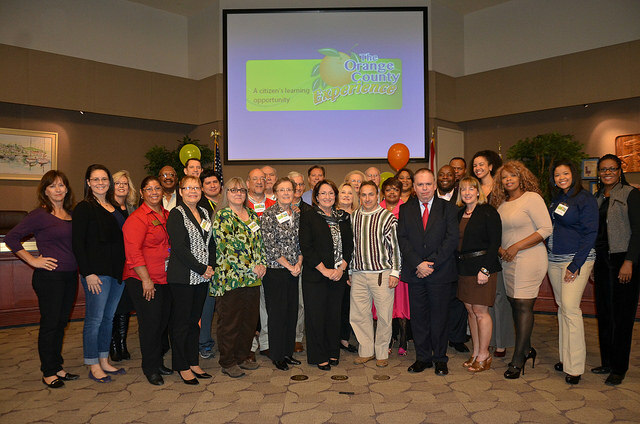 A collection of photos from the Orange County Experience certificate ceremony is available for use by the media and are located on Flickr.